Our bodies consist of a number of biological systems. They carry out certain functions necessary for everyday activities we perform. For example, the job of the circulatory system is to move blood, nutrients, oxygen, carbon dioxide, and hormones, around the body. It consists of the heart, blood, blood vessels, arteries and veins. Similarly the other parts perform their own jobs separately yet along with all the other organs. How important do you think it is to keep all these organs working right? It is very important! Let us see how we can do it in our sections below. What does a Regular Full Body Health Checkup include? Initially your doctor inspects your health with a physical examination. This includes checking for the vitals like blood pressure, height, weight, pulse rate and temperature. A complete blood count tests helps in detecting the density of the blood, white blood cells, red blood cells and helps in diagnosing for infections, anemia or symptoms for any other diseases. Diabetes, a very common blood test during which the blood is drawn twice, once fasting (8 hours empty stomach) and random or post-prandia (PP) that is after 2 hours of meal intake. Another test that helps your doctor conclude on if you are pre-diabetic or diabetic is Hb1Ac blood test. This provides an average of 3 months blood sugar level in your blood. Liver function tests, which includes assessing of your SGOT (Serum glutamic oxaloacetic transaminase), SGPT (Serum glutamic pyruvic transaminase) and Alkaline Phosphate levels in the body. This blood test helps in checking of the enzyme level in the body and any variation in the enzyme levels indicates a possibility of abnormal liver cells. This blood test helps in diagnosing the functioning of the liver and helps diagnosing liver diseases if any. Kidney function blood test, which includes blood serum tests like Creatinine and BUN helps in diagnosis of kidney dysfunction and the level of deterioration and damage, can be identified. ECG helps in determining the heart rate and checking for the uniformity of the heart beat. This also helps in checking the state of the heart muscles and helps in diagnosing any heart disease. Imaging tests like X-ray help in assessing problems in the chest area and other bone related problems. Ultrasound, CT and MRI help in diagnosing problems associated with any organs as they give a clear picture of the organs and help in diagnosing problems associated with liver, kidney, spleen, gall bladder, common bile duct and pancreas and others. These regular full body checkups may also include cancer specific tests like PSA (Prostate-Specific Antigen) for men and mammography and some gynecological tests for women if the doctor wants you to be screened for these diseases. Which of the chronic diseases can you prevent with Regular Full Body Checkups? India yesterday was burdened with diseases like communicable, maternal, neonatal and nutritional (CMMND) and these had been the reasons for deaths and disability in the country two decades ago. India today is still burdened with diseases, but we can see the shift. In 2016 the major reason for deaths and disability in India has been considered as non-communicable diseases such as cardiovascular diseases and chronic obstructive pulmonary disease, kidney diseases, diabetes, cancer and other chronic diseases. According to a report of the Global Burden of Disease study heart diseases caused the most deaths in India in 2016. Ischemic Heart Disease topped the list of causes of death followed by chronic obstructive pulmonary disease (COPD). The other diseases that followed were stroke, diabetes, and chronic kidney disease. These diseases have shown their prevalence more in developed states than in under-developed states in India. There has been an exceptional rise in the per capita income and GDP of India, and so has the prevalence of diseases increased. This is due to busy lifestyle, changing dietary habits, lesser physical activities, intensive use of tobacco, alcoholism and many other environmental factors. The working age group of 25 to 55 is the group of population that is most affected and which gets targeted for disease suffering. Changing your busy schedule a little and planning it a little better will definitely help you in prevention of these life threatening diseases. A regular full body health checkup will pave way to a better quality of health as, regular full body health checkup helps in early detection of diseases. It is boon to the doctors as well as the patients as with today’s healthcare facility the doctors can decide on the treatment faster than they could earlier. Before theses advanced diagnostic tests were introduced, doctors treated their patients only on the physical and visual symptoms they could see, but today things have become easier. Doctors can diagnose almost every disease and treat most of them with the help of advanced, new tests that help in detecting diseases even before the symptoms show up and prevent most of the chronic diseases and even cancer. “A stitch in time saves nine”. This is a very old proverb but so meaningful when applied practically. Every disease begins small and has an initial stage. It is very important that you find it out in the nascent stage and get rid of it from the roots. Today there is amazing change in the thinking of the people as they are shifting their mindset from being curative to preventive. But yet, there are only a few who are following this. Government of India has been working towards proving healthcare to all at affordable costs. There are several programmes that are being introduced and many healthcare camps are being set up at different rural and urban areas to provide free health checkup which will help doctors screen people for different diseases at early stage. Full body checkup is something that not everybody knows about, and even if few know about it, the benefits are ignored. We can always spread the awareness and importance of full body checkup to others. This will definitely help everybody take steps to prevent themselves from the chronic and life threatening diseases at an early stage. It can also save on the huge treatment costs we spend on curing the chronic diseases. Daggubati Purandeswari, Union Minister of State for Commerce and Industry of 2013 told the reporters of The Hindu, “Compulsory health check up should be re-introduced in schools to improve the health of children and awareness of parents”. She spoke about how parents followed up the health checkup reports that were sent from schools in early days. And how the reports gave details about the child’s eyesight, oral hygiene, fitness details like overweight, underweight and if there were any other medical conditions. This will definitely help us taking care of the child heath at an early age and build a healthy future. She also said “this would improve the health awareness of several parents too”. We can also spread awareness about the reasons that cause chronic diseases. For example, we can create awareness about how use of tobacco products can lead to oral cancer and how can we quit the usage of these products. Taking care of everybody’s health will lead to a healthy and a better society. There are a number of excuses we use to avoid getting a whole body health checkup done. Some say “I am too healthy” and some others say “I am too busy to get a health check done”. Such excuses are endless and harmful too. In the middle of our busy and fast paced schedule, we often tend to neglect our health, not understanding or thinking much about what could be the repercussions of doing so. In such times it is usually the best decision to visit your healthcare provider for medical checkups and health services. But, if you don’t have one, you can consult any general physician to refer to the essential tests. Lesser healthcare costs – regular health checkups helps in early detection of diseases which in turn helps to save a good amount of money in the long run. This is because it will reduce the risk of potential health ailments that can be life threatening in turn reducing the risks of surgery or any other more serious medical care in near future. Prevention – gives your doctor to choose a way to diagnose any health issues you have at an early stage and help you lead a healthy life. It is also better to spend a little today to save a lot tomorrow. Regular health checks include several blood tests that help in eliminating the risk of various diseases associated with blood like cholesterol, diabetes, cancer, high blood pressure, anemia, HIV/AIDS, and coronary artery diseases. A blood test also helps the doctor to properly evaluate the functioning of various body organs, like liver, kidneys, heart, and thyroid. It is not only what you eat but also the way you live that affects your lifestyle. Fast moving life and hectic work schedules, unhealthy eating habits and sleeping patterns have lead to many stress related diseases like hypertension, weight problems, mental disorders, diabetes, Alzheimer’s disease, depression, asthma, and gastrointestinal problems. With regular full body checkup it is easier to diagnose and detect these problems way before they threaten your life. You are more aware about your health – depending on the results of your tests, you can be warned before-hand about various habits you will need to take care about. Example, quitting of smoking and alcohol can help you reduce the risk of oral cancer, ulcers, and liver and kidney problems. Regular health checkups help your doctor guide you to follow proper care routine for these areas and different health aspects. How can I get my appointment for regular full body health checkups in Bangalore? Illness never differentiates between the rich and the poor. Healthcare is everybody’s need. Yes, few can afford it, few of them ignore and most of them cannot afford it. Medical science has progressed really well to give longer life span to all of us. It has developed technologically so well to make sure every person has a greater physical well being. Healthcare advancements have seen sky height and one of the areas where this achievement has been particularly helpful is the diagnostic tests. The technological advancements and better methods of early and accurate detection of diseases in this area have helped us beat on the diseases early enough. But how do you find which is the best place to choose to go for a Full Body Checkup in Bangalore? With BookMyScans, it is now possible to use these modern diagnostics for full body checkups to the maximum advantage. 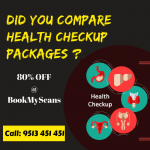 Bookmyscans caters to every diagnostic need you have and helps you to get these tests done at affordable and discounted prices. We are aware of the customer’s pain areas and we work round the close to make sure you can get in touch with us anytime of the day. 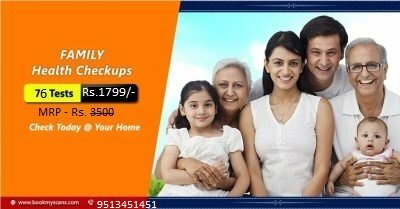 We help you find the nearest diagnostic center in your locality and also help you compare prices across different diagnostic centers. To make sure you get the best quality results, Bookmyscans partners only with centers that are AERB approved and ISO and NABL certified and the results are accepted by most of the doctors across Bangalore. These diagnostic partners are audited regularly. You have the advantage of viewing reports online and downloading them whenever needed. Bookmyscans has helped more than 10,000 people meet their diagnostic needs and has helped them save more than 1.2 crores on the diagnostics and treatment costs. A healthy society at large is a wealthy future of our country.